Ever wonder how you fare compared to other not-for-profits/non-government organisations (NGOs) when it comes to your website, email communications, fundraising tools and social media? 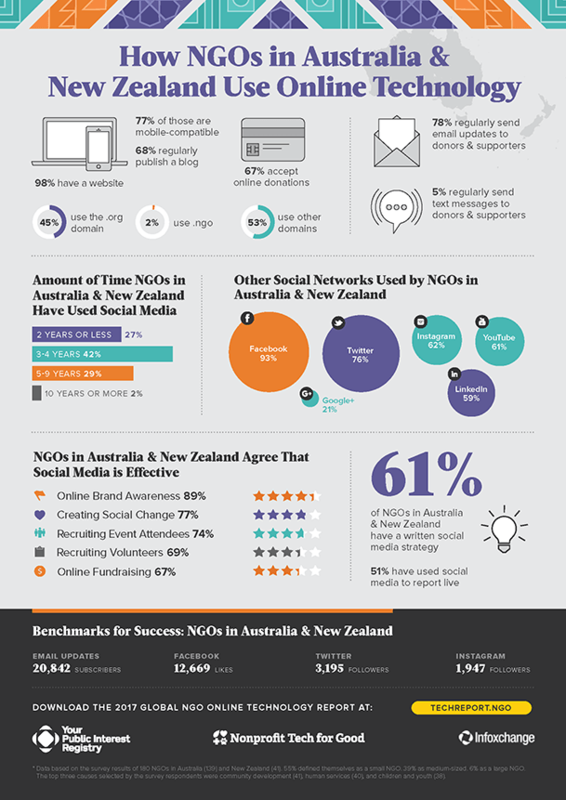 There is no need to stick your finger in the air this year because the 2017 Global NGO Online Technology Report has everything you’re looking for and below we have exclusive, in-depth data for Australia and New Zealand. The good news is that Australia and New Zealand rate above average across most platforms globally. Our CEO, David Spriggs, says this is a significant uplift from one to two years ago. “Two years ago we were lagging behind in the use of mobile-compatible websites, now 77 percent of not-for-profits have one,” David says. David says the challenge now is how we are allocating our limited resources to manage all of these channels. “Social media, marketing and fundraising strategies, as well as dedicated staff, are critical if not-for-profits are going to remain relevant in an increasingly competitive world,” David says. “Only seven percent of organisations have a full-time or part-time social media manager – this is just not enough investment. The results of this survey inform our capacity building programs like Improve IT and ensure that we provide the right IT services to small, medium and large not-for-profits. Find out more about what we offer in IT strategy and planning services. The 2017 Global NGO Online Technology Report is sponsored by the Public Interest Registry and run by Nonprofit Tech for Good. Read the full 2017 Global NGO Online Technology Report.